I'm sitting here with the heating on, wrapped up in fleece and heavy jeans looking out at the driving December rain from my home office window. 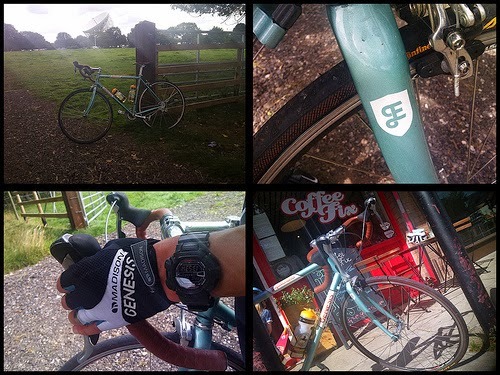 Seems like as good a time as any to write a review of the bike that has been getting most of my attention over the summer ( remember how good the weather was this year?!). It wasn't planned like this, I'm a mountain biker, I live for fat tyres and get stuck in debates about wheel sizes versus suspension settings. Truth is, before this summer, I'd never even ridden a road bike before ( the closest I got was riding my big brothers road bike when I was about 8 ). But I've thought about it. I've thought about it a lot. Who hasn't watched Wiggo or Cav and fancied a bit of that? Who hasn't seen an epic set of hairpins on the side of a big hill and thought about hitting them up on something fast with dropped handlebars? So I did it, announced as a legacy of the 2012 Olympics I entered the Ride London 100 as soon as it was open. That was the plan for 2013. Then I didn't get a place. Then I realised it was the same rubbish you get with the London Marathon.If you are not signed up to a charity, forget it. It's a closed shop. Road bike project put on hold. Then my viewpoint on the world changed. I was working at a show in Birmingham and catching up with legendary Bike Photographer Steve Behr. He told me that our joint friend and industry pillar Michael Bonney had been in a bike accident and was fighting for his life. I'm not really sure what happened next, but as Michael started to fight back it became clear some help would be needed. So along with many other people around the world I stepped up and looked for a way to raise some cash and deliver on his request to 'Get Out and Ride'. And the 100 Mile Challenge was born. So cutting to the chase ( and the review ) I had opted to ride the 60 Mile Sportive in Penrith as part of the challenge. 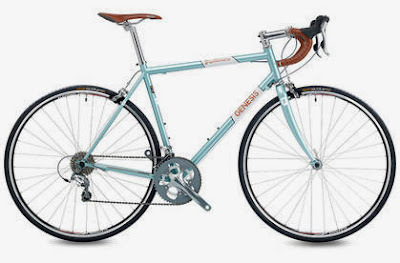 So I needed a bike, a cool bike, a bike that would make the most of what 2 wheeled skill I had. 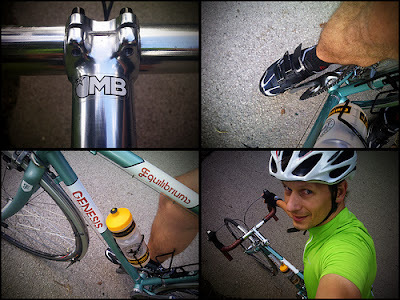 Step forward Genesis bikes and the 2013 Equilibrium 10 Road bike. Unboxing this was something special. It was scary and unknown. My bike builds over the past decade have all been about sorting out sag and working out how the thru axle works. This was new, this was skinny, this looked dangerous?! Walk around any city and you will see thousands of people on skinny tyres in all weathers, but having been stuck in a world of 2.5inches and now having to consider 25mm, this was all a bit alien. Then there were the combined brake and shifters. 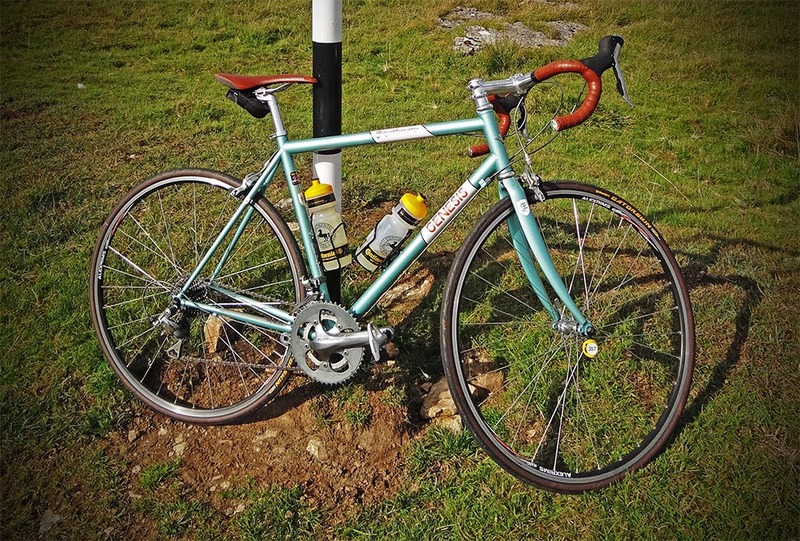 This model opted for Shimano Tiagra 4600 joined to Tektra R317 brakes with a cable? Wait up, no hydraulics? How is this thing going to stop? And come to think about it, how do you change gear? Out came some old SPD pedals from my hardtail and out on the open road to work out how this steel beast worked. Why don't roadies like valve caps? In short, It worked, and it worked fast. Push down and it moved forward. No loss of power into bouncy forks, no fat tyre knobs dragging. Just speed and lots of it. I even started to work out how to change gear and managed to work out how to stop and not fall off. But it wasn't quite right. It was like I was playing golf with a cricket bat. Some new riding kit was needed. Step up Madison and some wife-scaring lycra along side some suitable Shimano roadie shoes and pedals. The roads were mine, now were would I go? I'm fortunate living on the border between Cheshire and Manchester. I have a world famous mountain bike shop at the end of my road, an Olympic class BMX track being built in the village and various team roadie types riding past my house on their way to the Peaks. 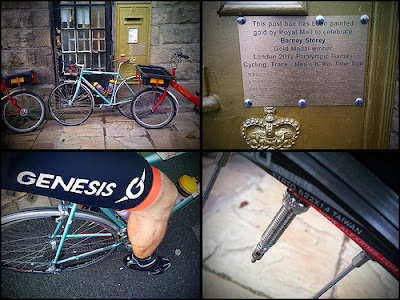 So I just headed out with this awesome piece of Reynolds 725 Steel underneath me. Comfort wise this was never going to be an easy transition, I quickly started to hate the conditions the roads are in. Though I also found you can bunny hop a steel frame over a pot hole when needed. After 10 or so miles the bike felt perfect for me. In fact my planned outing of 6 miles following a running route I use, quickly became a 20 miler. My next ride was supposed to be 15 miles and that became 30 miles. This bike made mile chomping easy! Looking at the bike it is clear that this is a 'classic' frame shape and I was riding in classic style on a 56cm frame which came up spot on for my size ( Mr Average at 5'10ish, 75kg, 32/32 ). Granted I had to jack the seat up to get that perfect form, but that was the only adjustment this bike needed out of the box. 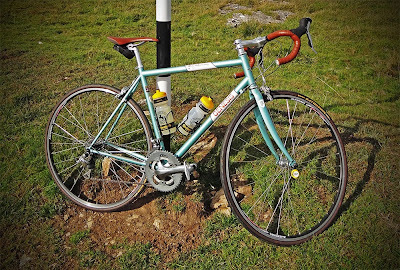 Heading up the Cat & Fiddle ride ( yes I was straight into hitting the big hills ), this bike looked after me like an old friend. Yes I was overtaken by hotshots on carbon wunderbikes, but I've never ridden uphill like a racing whippet, this was about the ride, not about the Strava section. Hitting the big downs was scary, but tucked down and holding on for dear life I loved it. After a couple of more rides I worked out that the tyres needed some upgrading ( the bike I had was used as a press sample so the tyres had been well used ). 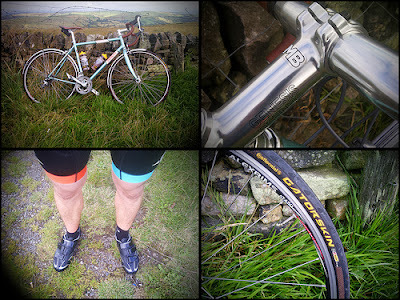 So I fitted some Conti Gatorskins. I also realised that roadies don't like backpacks and use those stretchy pockets on their tops, so instead of a camelbak I got some Conti bottles to keep the sweat glands happy. The build was near perfect. Then came the mighty sportive and 60 miles around Penrith. It was ace and even better once I re-adjusted my seat even higher. I'm happy to say I lived up to Michael's 'Get out and ride' request. So what do I think about this bike? Well it's a dream in steel. For the hardened carbon weight weenie this is going to be a good winter training bike ( not even sure why I typed that, but it seems to be what that bunch like to hear? ). Not sure why, but there is something about having steel that is always going to be special and the Genesis brand just seem to be on the money for keeping a brand keen and core. For mountain bikers, cut the crap, get an Equilibriuma and explore the other trails out there. For the non-biker, the roads are yours, get off the sofa and reclaim them. Would I change anything? At the moment no. Everything on this bike works. Yes when some of the kit starts to wear I'll upgrade, but not too much. This isn't a bike that needs all the bells and whistles. It's a bike that just needs to be ridden..... though there is a 2014 version with disc brakes...and that does sound tasty.